Here are a couple of chances to see some jazz on the big screen, courtesy of The Barbican in London. 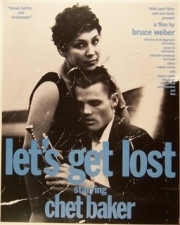 The classic film of jazz trumpeter-singer Chet Baker in his drugs-fueled ’50s heyday, Let’s Get Lost, is to be re-released on the big screen on June 6th. Made in 1988 by Bruce Weber, it features a series of interviews with Baker, his friends, families, associates and lovers, interspersed with footage of his early performances days. Hancock provides the musical arrangements. This rare screening is on June 8th at 3.30pm, tickets are priced at £8.50. See more at The Barbican film website here .